Wearing her Sunday best this owl is sure to turn heads. 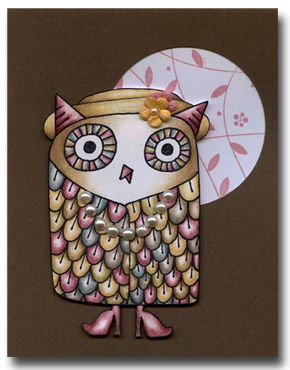 Stamp the owl onto white card stock with black ink. Draw a hat with a Permawriter pen. Color with pencils and cut out. Draw a pair of shoes, color and cut out. Affix to the back of the owl. Add a strand of pearls at the neckline and small paper flowers on the hat. Stamp the inside of a Mocha card with the Wavy Leaf pattern in pink ink. Punch a large circle in the Mocha card. Affix the owl in place. Sketch accessories with pencil before using the Permawriter pen.